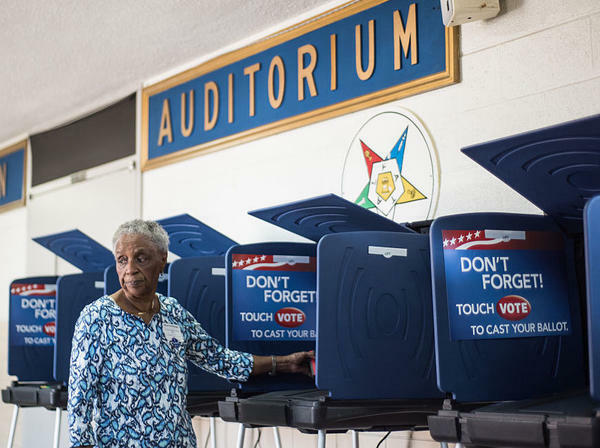 A poll worker prepares a voting machine before the South Carolina primary. The recent hacking of the Democratic Party databases has raised questions about potential issues with voting systems. The recent hacking of Democratic Party databases — and strong suspicions that the Russian government is involved — have led to new fears that America's voting systems are vulnerable to attack and that an outsider could try to disrupt the upcoming elections. A cyberattack on U.S. elections isn't as far-fetched as you might think. Just a week and a half ago, Illinois election officials shut down that state's voter registration database after discovering it had been hacked. In June, Arizona took its voter registration system offline after the FBI warned it too might have been hacked, although no evidence of that was found. In May, security analyst David Levin was arrested after he gained access to the Lee County, Fla., elections website. Levin said in a YouTube video he was only trying to show how vulnerable the system was: "Yeah, you could be in Siberia and still perform the attack that I performed on the local supervisor of election website. So this is very important." The county says the problems were later fixed. "Wherever there's a fully electronic voting system, there's potential for tampering of some kind," said Pamela Smith, president of Verified Voting. She says her nonprofit group has been warning about such tampering for years. Smith says the Democratic Party hacks are another red flag that someone might try to interfere with election results, and that there are many ways to do that. "If you can get at an election management system, you could potentially alter results, or muddy up the results, or you could even just shed doubt on the outcome because you make it clear that there's been tampering," she says. The problem is exacerbated by the fact that U.S. elections are locally run, with thousands of different systems and varying degrees of security. The good news is that a growing number of voters are using machines that have paper backups to double-check any suspicious results. "Today, 80 percent of Americans will vote either on a paper ballot that's read by a scanner, or on an electronic voting machine that has a paper trail that they can review," says Larry Norden with the Brennan Center for Justice in New York. But that also means 20 percent of voters don't use a paper-backed system — including a large number in the key battleground states of Pennsylvania and Virginia. Security experts argue that if those machines are hacked, it might be almost impossible to know. Norden thinks election officials have to take steps now to ensure it doesn't happen. "Every single machine before it's used should get a thorough test to make sure that there aren't problems, that the machines are recording votes correctly, that nothing is missing, no names are missing from the ballot," he says. And wherever possible, he adds, there should be paper records to back up voter registration databases, which are increasingly online. Edgardo Cortes, commissioner of elections in Virginia, says his office is spending a lot of time and resources this year trying to make sure its technology is secure. "We have somebody from outside come and take a look at our systems," he says, "look at access to those systems, look at how the data's stored, how it's housed, to come back and report to us and say, 'OK, here are the things that are working well, here's the things that you can improve upon.' "
Cortes knows how vulnerable voting can be. Last year, the state had to order some of its voting machines replaced after it was discovered they allowed for wireless access, which meant anyone could have tampered with the results. Smith of Verified Voting also warns that more states are allowing overseas and military voters to cast their ballots online — another opportunity for mischief. She recommends that absentee voters send their ballots in the mail instead. The recent hack of Democratic Party databases and strong suspicions that the Russian government was involved have led to new fears that America's voting systems are vulnerable to attack and that it's conceivable an outsider could try to disrupt the upcoming elections. NPR's Pam Fessler reports. PAM FESSLER, BYLINE: A cyberattack on U.S. elections isn't as farfetched as you might think. Just a week and a half ago, Illinois election officials shut down the state's voter registration database after discovering it had been hacked. In June, Arizona took its voter registration system offline after the FBI warned it, too, might have been hacked, although no evidence was found. And in May, a security analyst in Florida, David Levin, was arrested after he gained access to the Lee County Elections website. Levin said in a YouTube video he was only trying to show how vulnerable the system is. DAVID LEVIN: Yeah, you could be in Siberia and still perform the attack that I performed on the local supervisor of election website. So this is very important. PAMELA SMITH: It's been our concern for a number of years that wherever you have a fully electronic system, there is a potential for tampering of some kind. FESSLER: Pamela Smith is president of Varified Voting, a group that's long called for more security. Smith says the recent Democratic Party hacks are another red flag that someone might be trying to interfere with election results, and there are many ways to do that. SMITH: If you can get at an election management system, you could potentially alter results or muddy up the results, or you could even just shed doubt on the outcome because you make it clear that there's been tampering. And the problem's exacerbated by the fact that U.S. elections are locally run with thousands of different systems and varying degrees of security. The good news is that a growing number of voters are using machines that have ways to double-check any suspicious results. Larry Norden is with the Brennan Center for Justice in New York. LARRY NORDEN: Today 80 percent of Americans will vote either on a paper ballot that's read by a scanner or on an electronic voting machine that has a paper trail that they can review. FESSLER: But that also means 20 percent of voters don't use a paperback system, including a large number in the key battleground states of Pennsylvania and Virginia. Security experts argue if those votes are hacked, it might be almost impossible to know. Norden thinks election officials have to take steps now to ensure it doesn't happen. NORDEN: Every single machine, before it's used, should get a thorough test to make sure that there aren't problems, that the machines are recording votes correctly, that nothing is missing, no names are missing from the ballot. FESSLER: And wherever possible, he says, there should be paper records to back up voter registration databases, which are increasingly online. Edgardo Cortes is the commissioner of elections in Virginia. He says his office has been spending a lot of time and resources trying to make sure the vote is secure. EDGARDO CORTES: We have somebody from outside come and take a look at our systems, look at access to those systems, look at how the data's stored, how it's housed, to come back and report to us and say, OK, here are the things that are working well; here's the things that you can improve upon. FESSLER: And Cortes knows how vulnerable voting can be. Last year the state quickly ordered some of its voting machines replaced after it was discovered they allowed for wireless access, which meant anyone could have tampered with the results. Pamela Smith of Verified Voting also warns that a growing number of states allow overseas and military voters to cast their ballots online, another opportunity for mischief. She recommends that absentee voters send their ballots in the mail instead. Pam Fessler, NPR News, Washington. Transcript provided by NPR, Copyright NPR.